This two part (with additions), ceramic mural was created by Elaine M Goodwin and Group 5 in 1994. 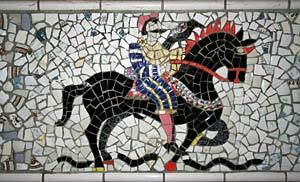 Decorating the walkway from Sidwell Street to the King William Carpark, it is inspired by the Bayeux Tapestry depicting William the Conqueror invading England in 1066 and approaching Exeter up what is now Longbrook Street, in 1068. One side of the mural depicts the story of King Harold up to just before the Battle of Hastings. The second long mural shows the Norman fleet departing France. At the end of the walkway, near the exit of the carpark are some large rectangular murals that show William being crowned as King on 25th December 1066 and Norman soldiers outside the walls of Exeter in 1068 during the seige of Exeter.